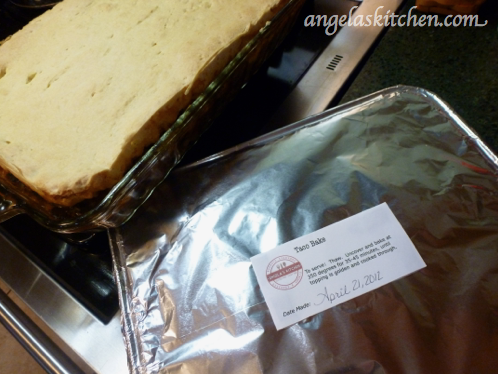 This recipe is part of the gluten and dairy free menu adaptations I did to the Once A Month Mom February 2010 menu. 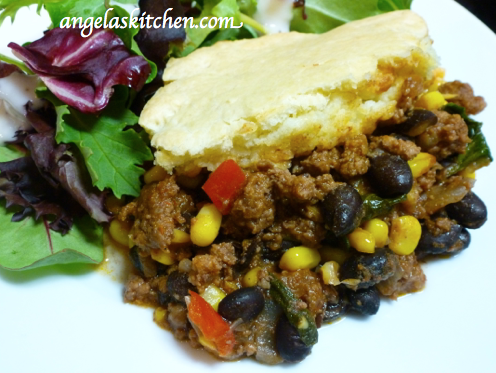 I have also included it in my May 2012 Southwestern Flavors Ground Meat Mini Freezer Menu (free printable freezer labels are on that post). We like to serve this with a big salad with avocados, and diced tomatoes and topped with Cilantro Dressing. To make a vegan dish, replace ground beef with 4 cups cooked lentils and 2 cups cooked quinoa mixed together. For printable labels for your freezer meal, go to the May 2012 Southwestern Flavors Ground Meat Mini Freezer Menu. Brown the ground beef, onion and green pepper; drain grease. Season to taste with salt and pepper. Stir in beans, tomato sauce, spinach, seasonings and corn. Stir until spinach wilts. Spread into 4 8×8 pans or 2 9×13 pans. Make taco bake roll topping: Mix dry ingredients and wet ingredients separately except for the sparkling water. Combine dry and wet in a heavy duty mixer or bowl with a spoon. When batter is well combined, add the sparkling water. Mix until combined. The texture of the batter should be rather thick and sticky. 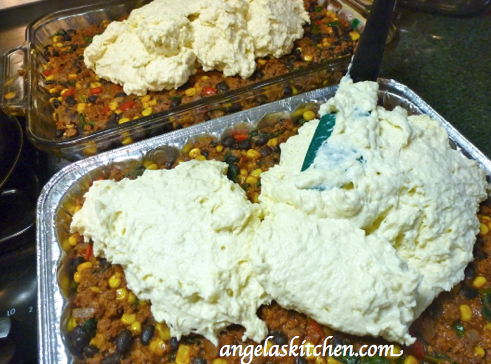 Dividing between pans, spread batter over the meat mixture smoothing to edges. Use very wet hands to smooth batter as needed. Cover and freeze (before baking). To serve: Thaw. Uncover and bake at 350 degrees for 35-45 minutes, until golden brown. To do egg-free: In the taco bake roll topping, replace egg with 3 tablespoons ground flax (I used golden flax) and 9 tablespoons water cooked together. Wisk over medium heat until thickened and gooey egg-like consistency. Allow to cool closer to room temperature before using in recipe.